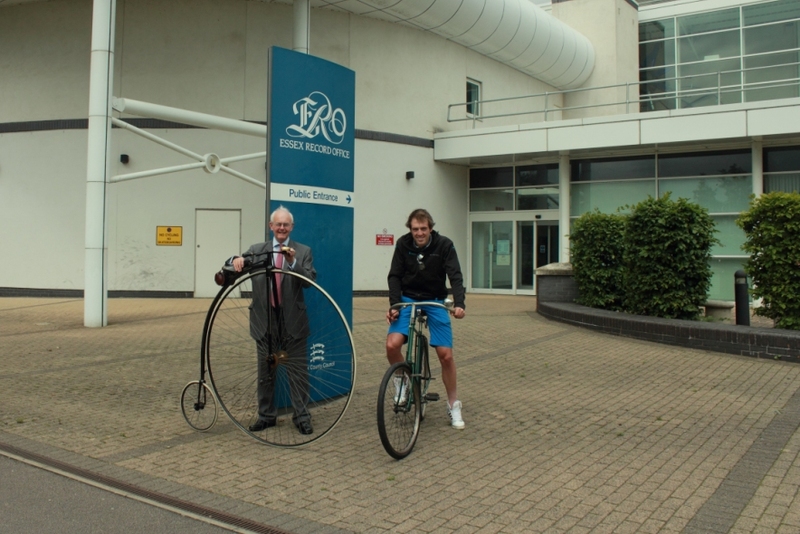 As the Tour de France draws to a close and Britain gears up to host the 2012 Olympics, Essex’s own home-grown medal-winning cycling Alex Dowsett paid a visit to the Essex Record Office to find out about the story of cycling in his home county. The Team Sky cyclist attended King Edward VI Grammar School in Chelmsford, and is the current British National Time Trial Champion. Alex took time out of his busy training schedule to visit the ERO ahead of his next major competition, the Eneco Tour, in the Netherlands and Belgium. 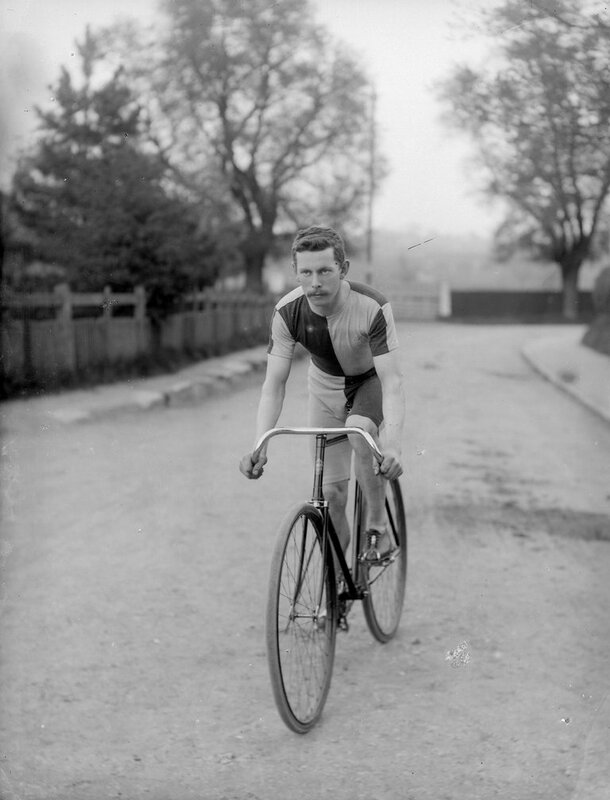 Cycling was a popular pastime in the late nineteenth and early twentieth centuries, and Essex was a popular choice with cyclists, particularly those from the London area as it was a short distance to ride out into the countryside from the London suburbs. 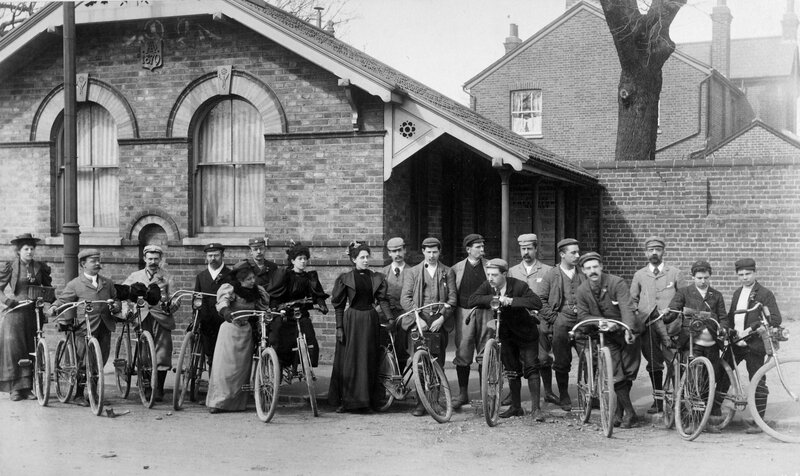 Many clubs were formed to organise social rides and competitions, and some clubs even had huts where members could stay overnight before returning home. 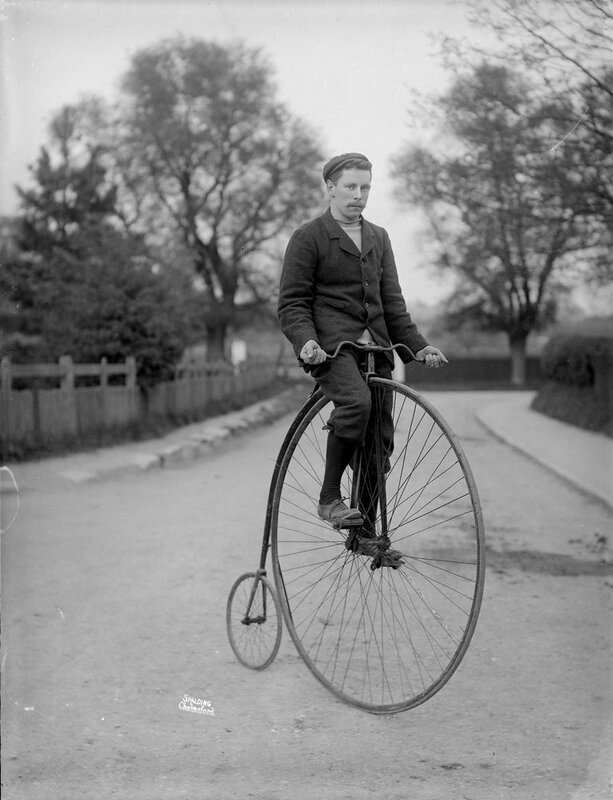 Races were held over long and short distances, and some even took place on penny farthings. Handbooks and maps gave cyclists advice about where to go in Essex, including one which advised that some of the terrain in Hadleigh, where the Olympic mountain biking event is taking place, was too dangerous to be ridden! 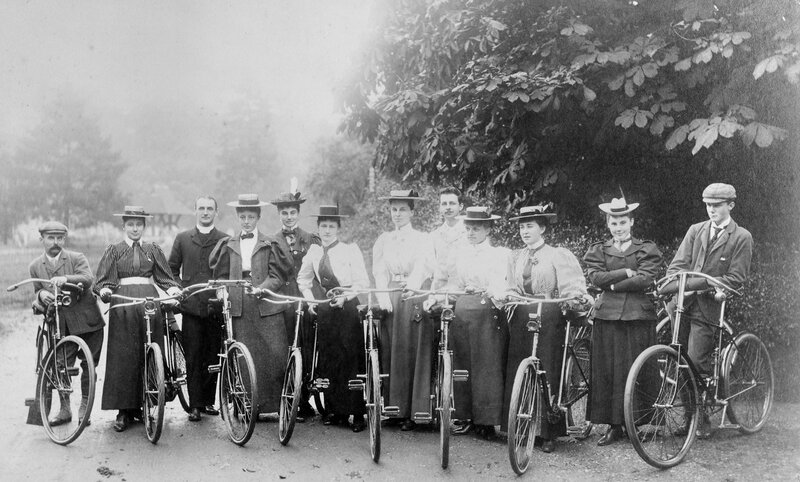 Even women took part in cycle rides, despite wearing restrictive corsets and ankle-length skirts. 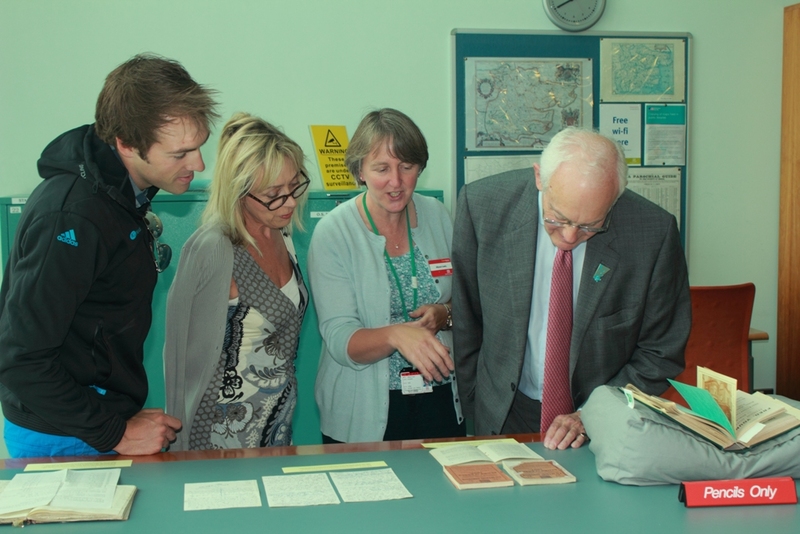 Archivist Allyson Lewis talked Alex and Councillor Jeremy Lucas, Cabinet Member for Customer Services, Environment and Culture, through the documents and images which tell this story. 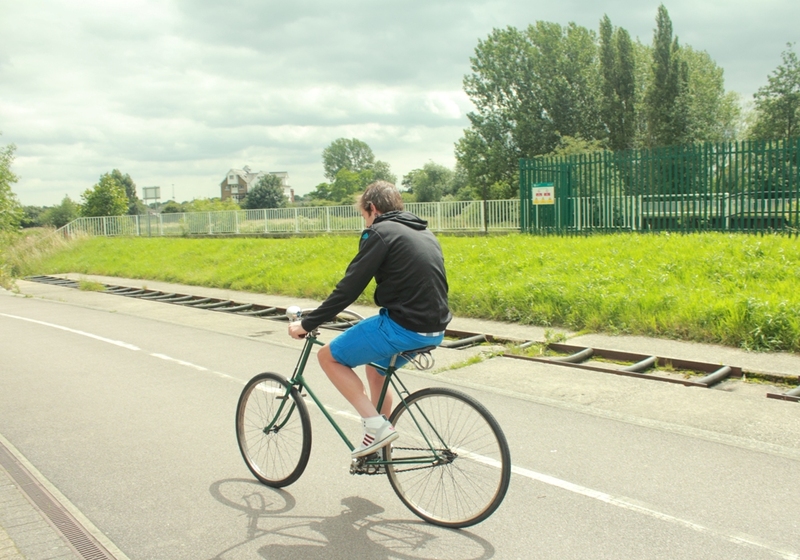 Alex not only got to see pictures of the kind of machines that his predecessors raced on, but got to try one out. We think he liked it. 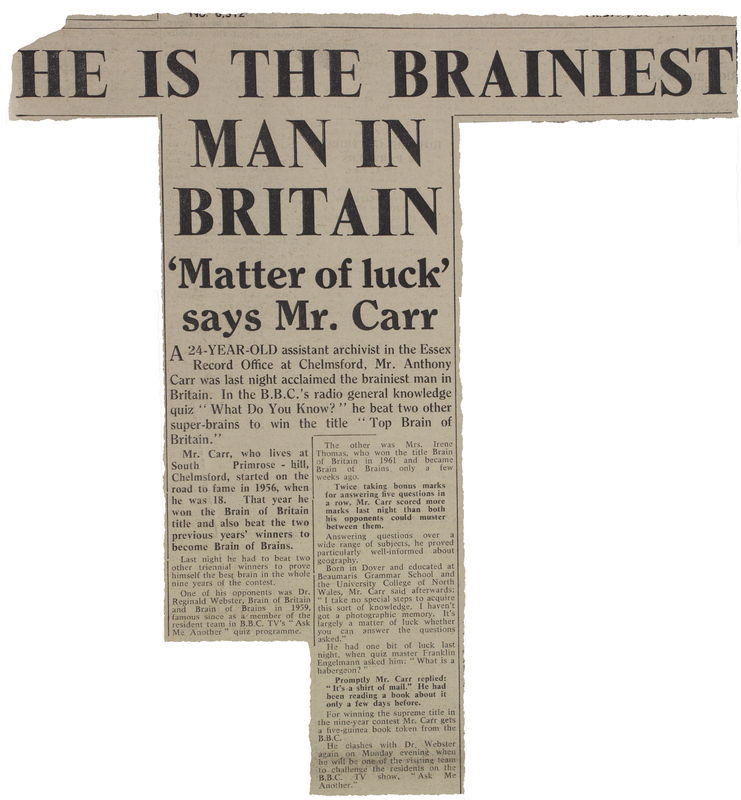 Many of the documents which Alex saw on his visit will be on display in the reception area of the Essex Record Office from next week. 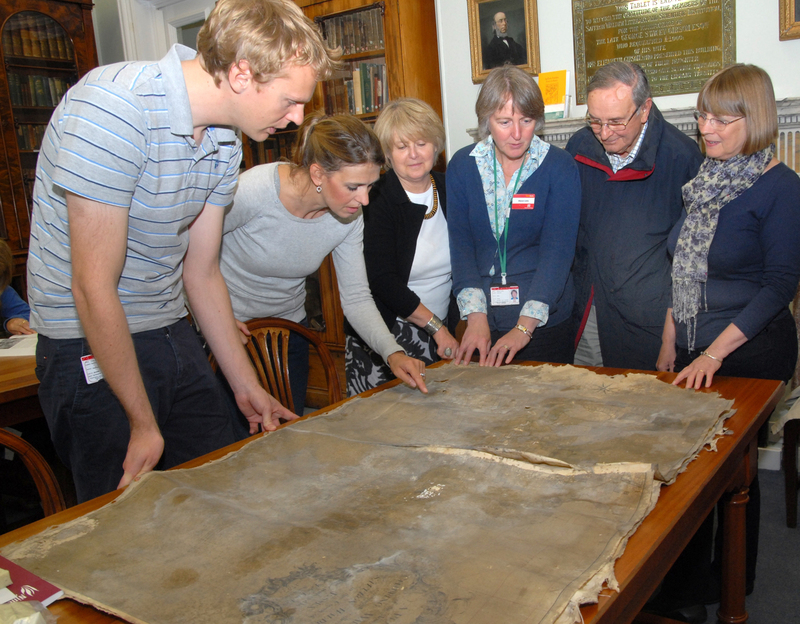 A map of Saffron Walden dating to 1757 has turned up in an outbuilding on a farm. The map was discovered at Bruncketts, Wendens Ambo, which would previously have served Mutlow Hall. The map has now been transferred to the Essex Record Office in Chelmsford on permanent loan. 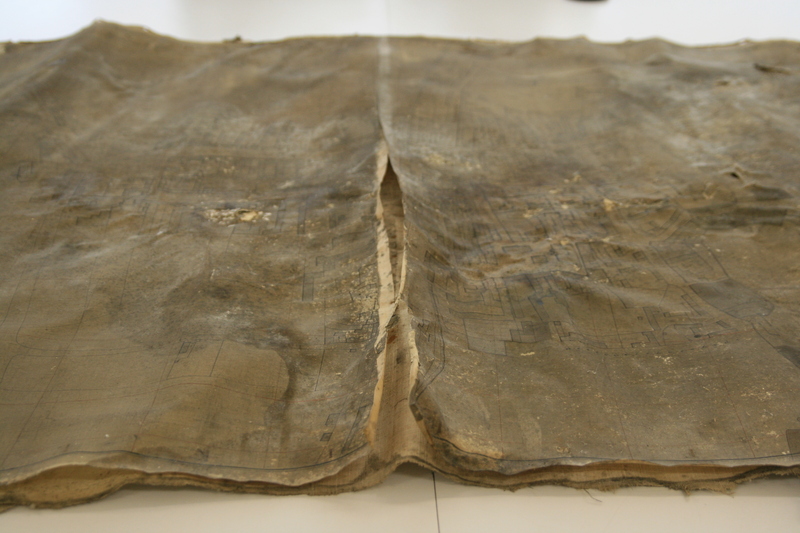 The map predates the previously earliest known map, made in 1758, by one year. 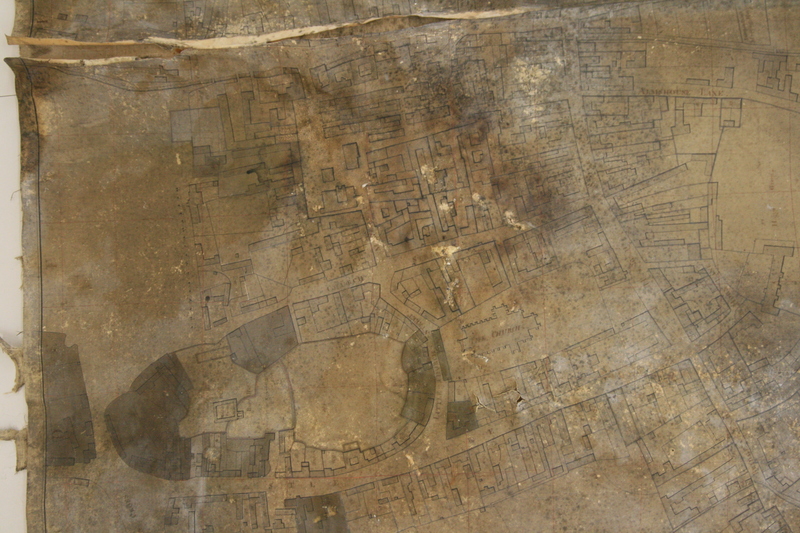 It shows the town of Saffron Walden, and despite its extremely poor condition the ink outlines of streets and buildings are still sharp and clear. The map has had a hard life up until now. It is drawn onto two pieces of parchment, which at some point had been mounted onto canvas and varnished. 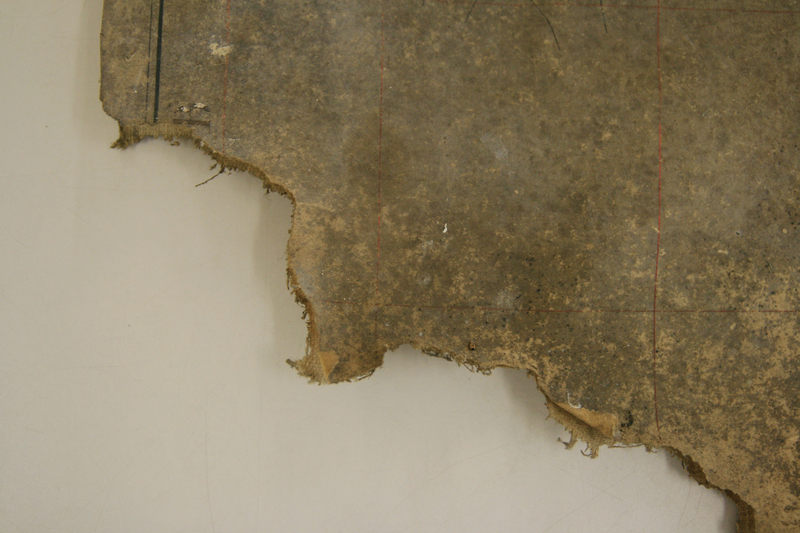 After being stored for years rolled up in damp conditions, the map has split down the middle, has numerous small tears in it, several different phases of mould growth, and a sizeable chunk of one corner has been eaten by rodents. The map was made by Edward John Eyre, whose later, larger 1758 map of the town and surrounding area may well already be familiar to Saffron Walden residents. It is likely that both maps were commissioned by Elizabeth Countess of Portsmouth or her nephew, Sir John Griffin Griffin, who inherited part of the nearby estate of Audley End. 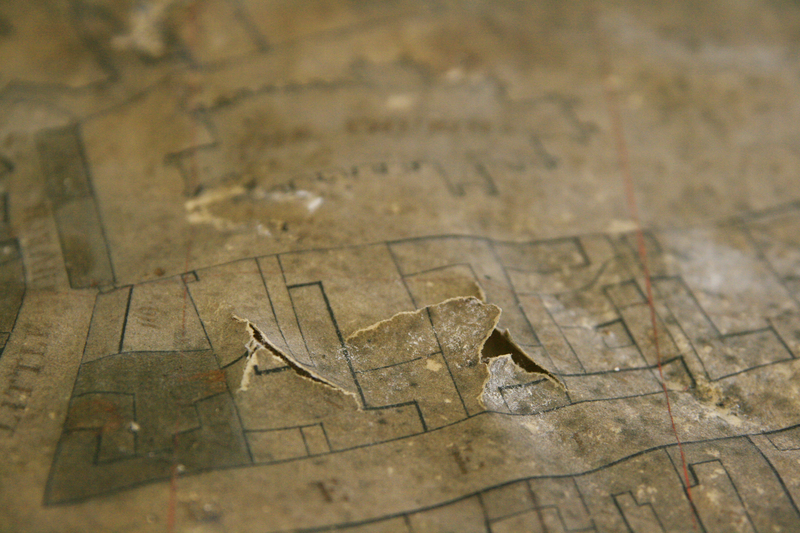 Expert conservators at the Essex Record Office will now work to stabilise the map to prevent any further damage, and make any repairs possible. Essex Record Office has just launched a small exhibition on poverty in Essex in the late seventeenth century which can be viewed in the Searchroom at Chelmsford. This is based on my research into the scale and nature of poverty in Essex between 1660 and 1700 for a PhD at the University of Roehampton. I am studying records held by Essex Record Office and The National Archives with the aim of identifying who was poor at that time and how the experiences of being poor differed within communities and across Essex as a whole. The records of the hearth tax, which mainly date from the 1660s and 1670s, give us a glimpse into the varied circumstances of Essex residents at that date. Every liable householder was required to pay a shilling for each hearth in their dwelling twice a year – at Lady Day (25 March) and Michaelmas (29 September). In an attempt to ensure that all revenue due to the Crown was collected, even those exempt from paying the tax were recorded in the returns. Exemption was granted to those who lacked the wherewithal to pay local church and poor rates, and to those who paid twenty shillings or less rent for their houses and whose goods were worth less than ten pounds. With three hearths or more, however, there was no avoiding the tax collector even if you met the other criteria. 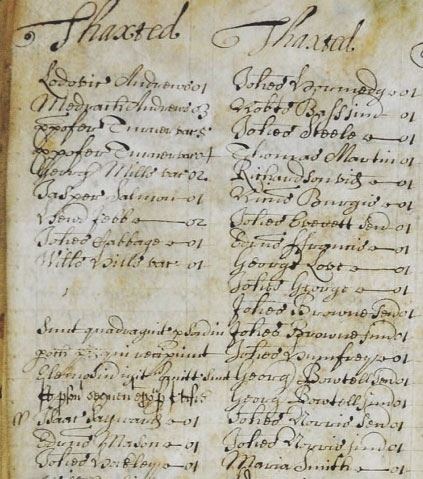 This extract from the hearth tax return for Michaelmas 1670 lists some of the householders in Thaxted and notes that there were also 40 people in receipt of alms (charitable payments or parish relief). The proportions of householders exempt from the hearth tax varied greatly across the county. The parishes closest to London tended to exhibit the lowest rates of exemption with an average of about 23%, possibly reflecting the relative prosperity brought by proximity to the London market. Those in the north and north-west of the county saw much higher exemption rates averaging about 63%. This may well have reflected the vulnerability of the many workers in the cloth industry who were based in that area. Interruptions to trade caused by wars, disease and local crises could result in a rapid change to dependent workers’ economic circumstances. 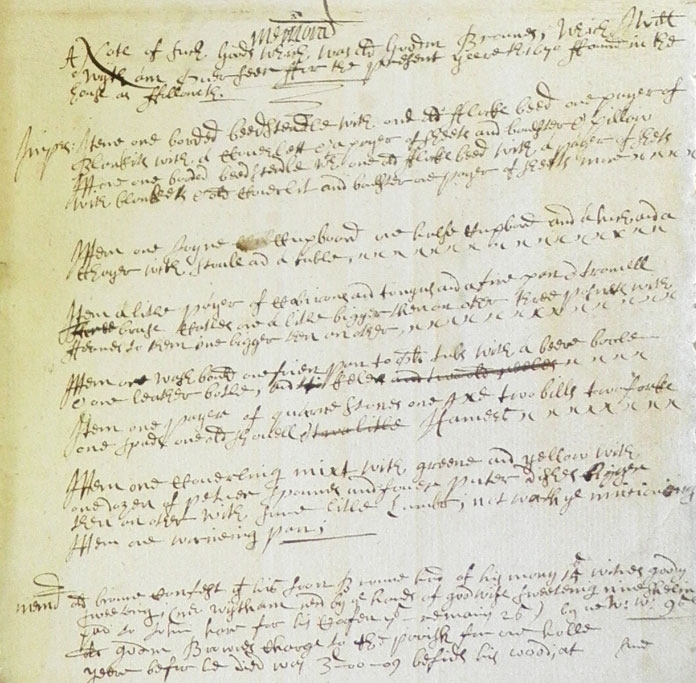 The Michaelmas 1670 hearth tax returns for Essex have been transcribed and analysed by the Centre for Hearth Tax Research at the Universityof Roehampton and are to be published this month by the British Record Society and a conference is being held to mark the launch. See http://www.hearthtax.org.uk/ for further details. Comparing the lists of those exempt from the hearth tax with recipients of poor relief, recorded in the few detailed sets of accounts produced by overseers of the poor, provides us with greater detail about what poverty meant and how people survived. Support was provided to those unable to work by parish officers under the Poor Relief Act of 1601. The Act also required that the unemployed should be put to work on tasks such as spinning and that poor children should be apprenticed to learn a useful trade. In practice,Essex parishes took different approaches to the problem of their poor depending on the particular local circumstances. Some poor, particularly widows, were paid regular pensions, although often the amount they were paid would have been insufficient without additional resources. In many cases, support was provided in kind, with clothing, fuel and food given directly to the poor. Sometimes the parish employed the poor to carry out odd jobs such as repairing the almshouse or digging graves. The care of orphaned and abandoned children often took up significant resources, with payments made to foster parents and the frequent supply of replacement clothing for their growing bodies. 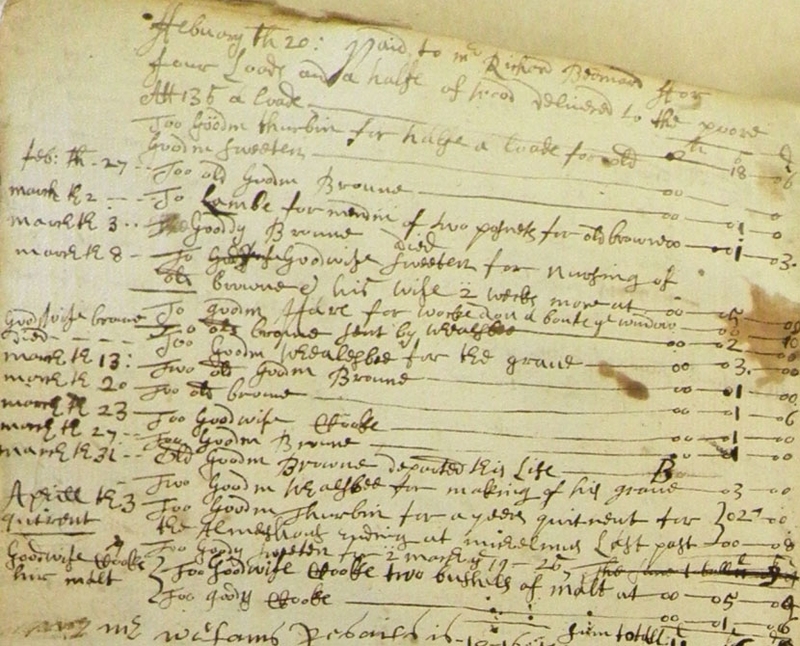 This extract from the accounts of the overseers of the poor of Barnston in 1671 shows a range of expenses incurred in support of the poor. A major expense derived from the last illnesses of husband and wife, Goodman and Goody Brown, with payments for nursing them and digging their graves (D/P 153/12). The Barnston overseers reclaimed some of their expenditure by disposing of the household goods of the Brown family after their death, although there were some debts to pay with the proceeds. 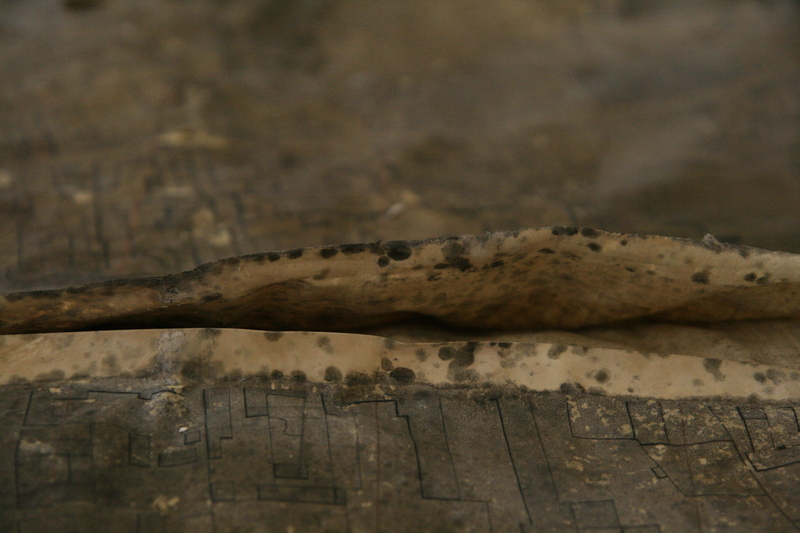 The inventory was recorded with their accounts (D/P 153/12). The list of goods suggests the Browns were not destitute, but nevertheless they were unable to survive in their final months without support from the parish and their neighbours. They were not alone. It must have been a frightening existence, knowing that illness, disability, fire, flood or theft could result in dependence on parish relief and charity, often grudgingly given. 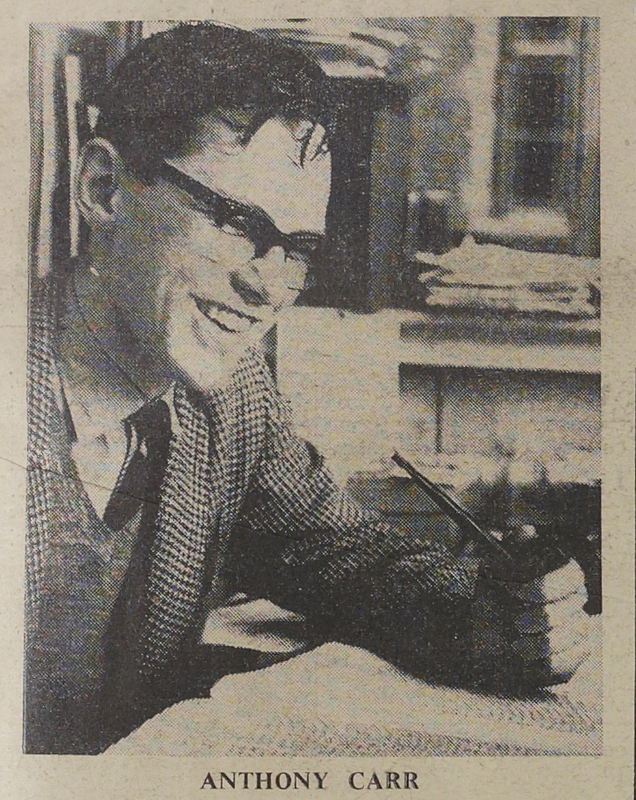 On that note, I am very grateful for the ungrudging funding awarded to this project by the Arts & Humanities Research Council and the Friends of Historic Essex and the help and support provided by Essex Record Office and The National Archives. Find out more about the hearth tax records at The Hearth Tax in Essex, our first conference of 2012, on Saturday 14 July. See our events page for more information.